^ CATE Creating a Taxonomic eScience - Sphingidae. 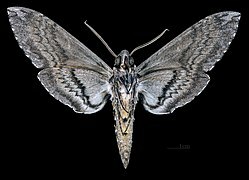 Cate-sphingidae.org. [2011-06-16]. （原始内容存档于2012-11-14）. ^ Villanueva, R. Tobacco hornworm, Manduca sexta (Linnaeus). Featured Creatures. 2007 [July 24, 2008].